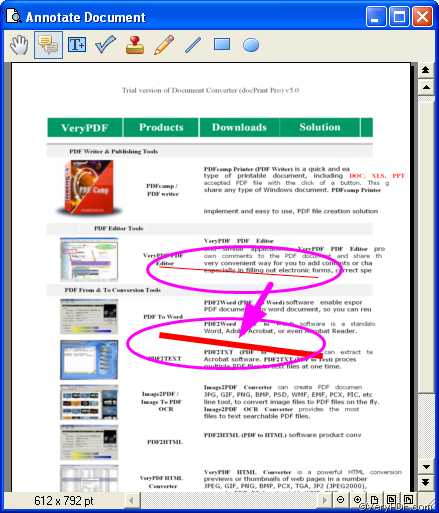 ← Besides converting pdf to jpg and bmp format, what about converting other image format? Cause we would like to convert pdf to wmf files. 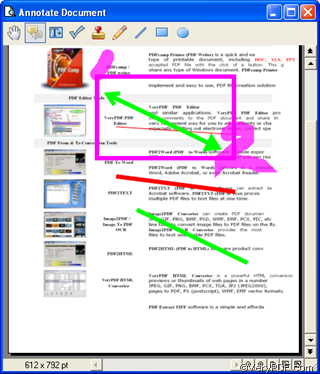 How can I add lines on pages in docPrint preview application? 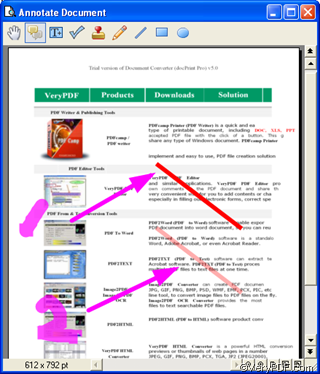 You can use the “Add Comments on Current Page” option to add lines, and text comments on the pages of documents in Verypdf docPrint preview application. You can add lines and lines with open arrows as well as close arrows on the pages. Moreover, you can change the color, style, and opacity of the lines. 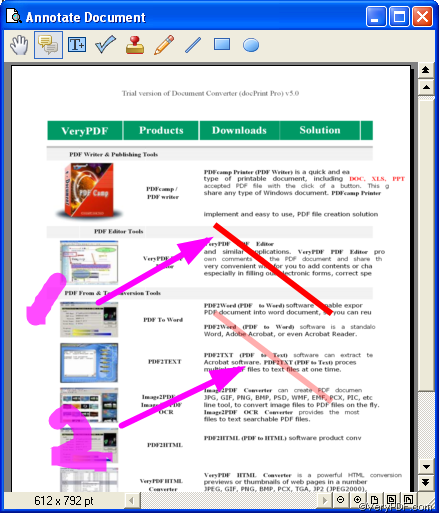 This article will show you how to add various lines on pages in Verypdf docPrint preview application. 1 Open the selected document. 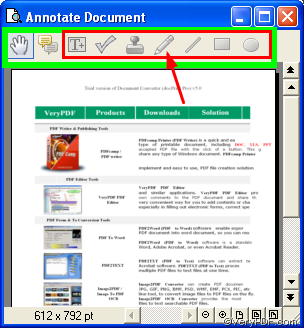 The following screen shot illustrates the “Annotated document” dialog box, where there are nine buttons marked by green rectangle. Seven of those buttons are gray, which are marked by a red rectangle. The grey buttons are comment buttons. Click >with press the left mouse key down, drag a line on the page. 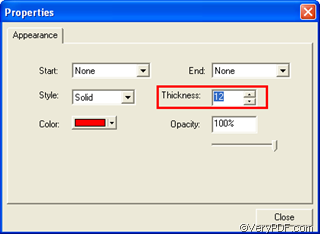 Repeat 4.1>select one line>right click this line>choose “Properties” to open the “Properties” dialog box>select the proper number as the “Thickness”, e.g., 12.>Click “Close” to close the “Properties” dialog box. Then you will see a bold line on the page. The following screen shot shows the comparison between the original line with the thickness set as “1” by default and the bold one with the thickness specified as “12’. 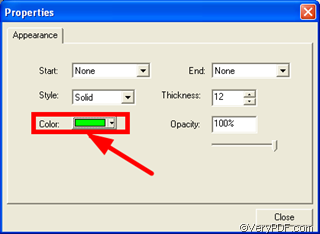 repeat 4.2 to draw a new bold line>right click this line>choose “Properties” to open the “Properties” dialog box>select the color you like as the “Color” of the line, e.g., green.>Click “Close” to close the “Properties” dialog box. 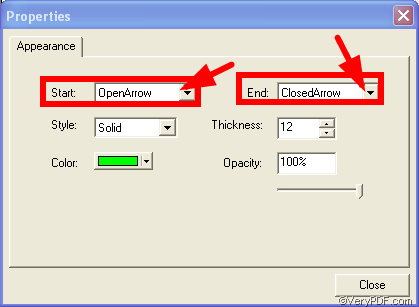 You can add arrows including open arrow and closed arrow at the start point as well as the end point of a line. Repeat 4.4 or copy and paste the green line to create a new green line> >right click this line>choose “Properties” to open the “Properties” dialog box>specify “Open Arrow” as the “Start” >specify “Closed Arrow” as “End”>Click “Close” to close the “Properties” dialog box. 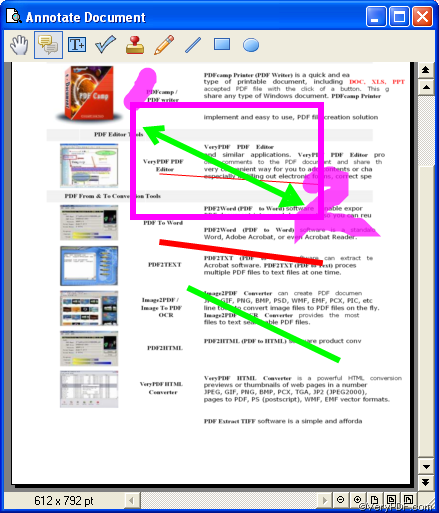 As you can see on the following screen shot, the marked line with arrows are the new created one. the arrow on the left is open arrow, while the arrow on the right is closed arrow. You can also use this method to create a line with only one arrow. Repeat 4.2 to create two new lines>select the second line>right click this line>choose “Properties” to open the “Properties” dialog box>change “Opacity to 52%>click “Close” to close the “Properties” dialog box. Then, compare the two lines on the page. 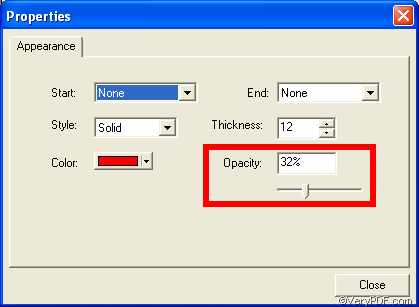 the second one whose opacity is “32%” is transparent, while the first one whose opacity is 100% is opaque. How to convert rtf to emf? 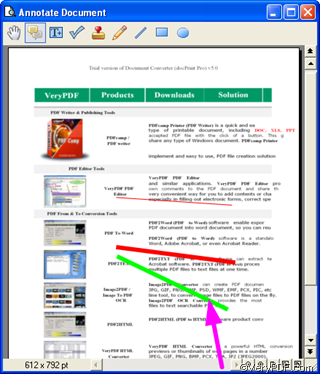 How to print OpenOffice documents of ODT to Postscript file?